We teach a mixed martial art, Shinsei Hapkido. 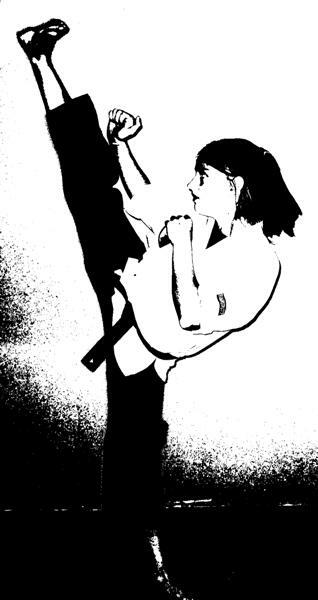 We also teach basic karate, self defense, weaponry, jujitsu and women's assault prevention. At this time, there is only a fee for Black Belt testing. This class focuses on ukemi, basic karate, basic hapkido, basic judo, self defense and limited grappling techniques. Memorization of a class creed and short essays at rank promotion are also required. This class is taking new students at this time. This class is normally run with two adult instructors. The focus is the same as Beginner Karate with the addition of advanced techniques in all areas, plus grappling and light contact sparring. This class is offered by invitation only. The Bo staff is the first weapon studied and students are required to pass a test on this weapon prior to Shodan testing. Other weapons are offered once the Bo is mastered (Korean Dagger, Sai, Tonfa, Sword). Live blades are reserved for black belts 16 years of age or older. This class is unique because it focuses on basic pre-school skills such as following directions, waiting turns, spatial awareness, stranger danger, memorization, basic tumbling and ukemi (the art of falling), and very core but basic karate movements. This class is N/A at this time. The age requirement for this class depends upon the student's attention span and focus. This class is geared to move students into the Beginner Karate level so we focus on the same concepts as Tiny Tots but there is a heavier emphasis on karate skills, ukemi, and mini-tests working them towards their first real karate rank. Students are required to memorize a school creed with body motions.This class is taking new students at this time. This class is for serious workouts and stress reduction! Boxing gloves or MMA wrap gloves are required. The class is 45 minutes long and contains warm up, aerobic sets of bag work, floor work, flexibility training and a cool down.This class is N/A at this time. Gentle, low-impact workout focusing on basic poses with modifications and instructions on breathing and breath control. Other toning floor work incorporated. The class is 45-60 minutes long. Wednesday evening at 6 pm and Saturday mornings at 9 am. This class is low-impact, high energy with modifications for experienced and inexperienced participants. The class is 45 minutes long and contains warm up, aerobic sets, floor work, flexibility training and a cool down.This class is Saturday mornings at 10:15 am. Call 419-289-8771 or 440-759-6633 for more information about any of our classes.